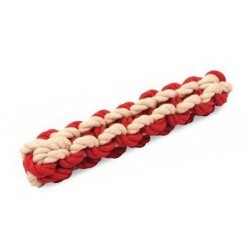 Product Details- Material- Cotton Rope, Use-ideal for outdoor and indoor activities. They are extremely durable and can keep pets entertained for hours. They also help floss teeth and massage gums, Suitable-Small or Teething Puppies, Dimensions - 20 cm. Product Information - The Anchor Chain toy is part of The New England range of high quality cotton rope toys. Ideal for outdoor or indoor activities. They are extremely durable and can keep pets entertained for hours on end. They also help floss teeth and massage gums. Made from cotton and rope.